Daylight plays a key role in providing a good visual, biologically effective and energy efficient lighting of indoor spaces. Generally, daylight is the light source preferred by humans. Daylight is the major source of regenerative energy for reducing lighting energy consumption. Electric lighting accounts for approximately 15% of the total electrical power consumption and 5% of greenhouse gas worldwide. 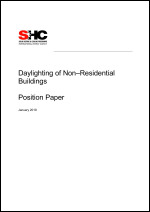 In nonresidential construction, daylighting – based on distinct evaluation procedures and integrated into diverse energy saving ordinances – has meanwhile become an energy-quantifiable and plannable light source that can be directly offset against the energy requirements for electrical lighting. 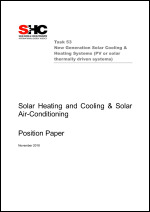 The purpose of this paper is to provide relevant information to energy policymakers so that they can understand why and how solar cooling and air-conditioning (SAC) systems should be supported and promoted. It presents state of the art solar thermal and photovoltaic supported solar heating and cooling systems. 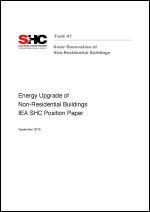 In addition, it provides a comprehensive summary of the main findings as provided by the IEA SHC Task 53 work . 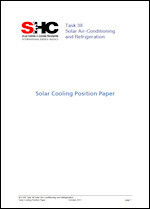 Written by leading experts in the field, this paper provides an inside view for energy policy makers to understand why and how solar cooling systems should be supported and promoted. The IEA’s Energy Technology Perspectives 2008 report shows that buildings are responsible for about 45% of the total energy consumption in OECD countries and 38% globally. More than half of the existing building stock will be standing in 2050 and more than 50% of the buildings in many OECD countries were built before 1970. The EU Parliament approved in April 2009 a recommendation that member states have to set intermediate goals for existing buildings as a fixed minimum percentage of buildings to be net zero energy by 2015 and 2020. This also includes the existing non-residential buildings, and a dramatic reduction in primary energy consumption will be needed. 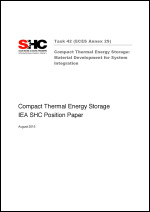 This position paper explains the potential, the present status of development and the market status of compact thermal energy storages. Its aim is to inform policy makers, decision makers and opinion makers about the technologies and to discuss the technological and non-technological barriers and the actions needed to accelerate the development and market uptake of these very important technologies. 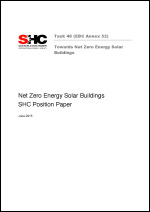 The aim of this Position Paper is to present the current status of the various research and pathways in designing and constructing net-zero energy buildings (NetZEBs). It is written to provide general information on this topic to policy and decision makers who may be in positions to facilitate the market uptake of NetZEB practices. The information therein draws from the work of the 82 National Experts from the 19 member countries that participated in the Task/Annex and have contributed so much knowledge to advancing this field. 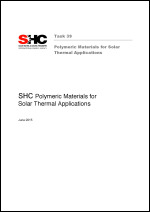 This position paper describes the current state of the art for polymeric materials in solar thermal applications, shows the potential of polymers in solar thermal applications, and encourages further R&D activities. The major advantages of using polymeric materials in solar thermal systems are economical aspects, especially when taking into account the increasing solar thermal market and increasing raw material prices for metals. Although the cost of materials per mass unit might often be put forward as a major advantage of polymers relative to metals in conventional collectors, the entire picture is more complex. Many successful applications of polymeric materials in solar thermal systems that perform equally well or better in terms of conventional energy savings, reduction of materials, as well as production, transport, installation and/or end-user costs have been demonstrated. 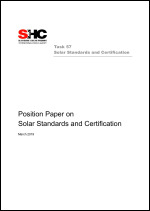 The purpose of this document is to provide an inside view to energy policy makers on why and how solar and heat pump systems should be supported and promoted. 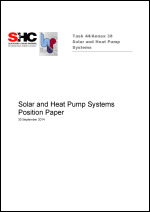 Solar and heat pump systems (S+HP) are a combined technology that represent a market share in the building heating and cooling segment due to their following advantages: high renewable energy share, low electricity demand, low primary energy demand, and low CO2 emission depending on the electricity mix feeding the heat pump. The market share of S+HP systems could reach 100% for new houses in many countries where the heat pump technology is well-established and solar is mandatory for domestic hot water. After ten years of numerous research, development and demonstration activities in the field of Solar air-conditioning, in particular within the IEA Solar Heating & Cooling Programme but also in many other national and European R&D projects, the market penetration of SAC remains small. Therefore, it is important to take a look at the achievements and the recent position of solar cooling technology. It is also important to understand the future perspective of this technology and formulate the needs related to both R&D and market stimulation in order to exploit the potentials. This is also important in order to understand the potential of solar heating and cooling technologies (SHC) to contribute to the achievement of politically set targets in the reduction of energy consumption. This paper describes the recent position of solar cooling technology and develops an outlook about the potential and needed actions. 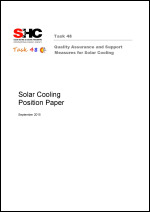 This document summarises the Position Paper on Solar Cooling developed by IEA SHC project “Solar Air-Conditioning and Refrigeration (Task38)".